I have some ripen banana in my kitchen. Immediately I think off baking banana cake. This time I choose recipe from one of my favourite recipe books-阿芳老师3杯面粉. The interesting about this book is all the recipes are based on 3 cups flours. It contains recipes like steamed bun, bread, Chinese pastry and cake. Ingredients used are simple and the methods are easy to follow. I still have lots of recipes to try on. For this time I’m going to share recipe on this banana cake. I half the recipe with minor changes. I replaced portion of flour with whole wheat and used ground brown flaxseed as well. Although the texture is not crumbly soft (with the used of whole wheat) it still great as butter cake. It is firmer and yet moist and packed with banana flavour. Definitely is great as breakfast and snack at any time! *sift all together except ground flaxseed. Then add in ground flaxseed and mix to combine. Set aside. 1. Beat butter with sugar until light and fluffy. Add in eggs (one at a time) and vanilla extract. Beat until well combined. 2. Add in mashed banana and fold to combine. Follow by flour mixture from (C) and walnuts (if using). Fold to combine. 3. Pour batter into the lined pan. Arrange banana slices on top. 4. Bake in preheated oven at 180C for about 40 minutes or until toothpick insert in the center of the cake come out clean. A lovely cake! The texture looks really moist and soft. Using part wholewheat flour is a wonderful idea! Thanks for linking! 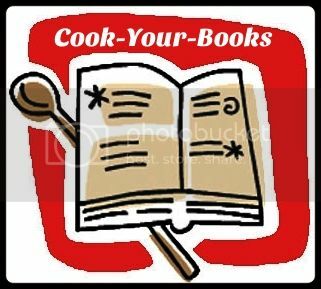 Just dropping by from Joyce's Cook Your Books. Your Whole Wheat Banana Cake looks so good. I like that you used two kinds of flour. I'm so glad I found you on Pinterest so I could pin it to my Banana Board. I like Kristy too, hoping I can have a bite on the first photo , this really sound healthy..
looks so inviting especially with the sliced bananas on top!